Like with the recent launch in Canada, Microsoft has confirmed via Twitter that that the Zune Pass which is coming to Australia next month will not have any ’10 free song’ benefits. 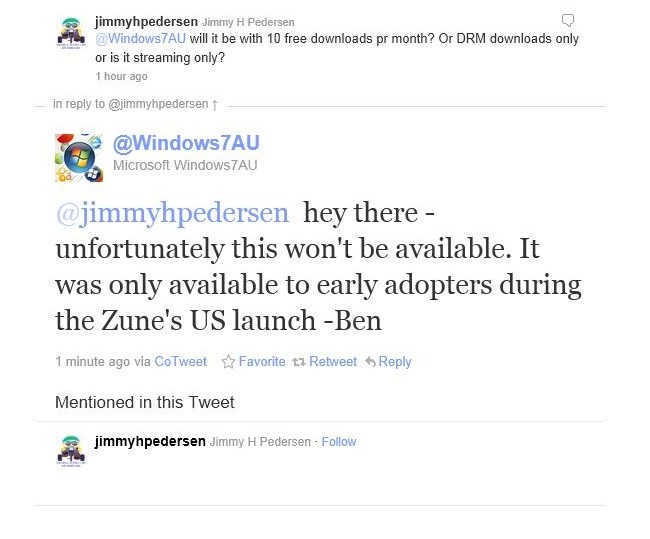 With the recent change and price drop in the US for the Zune Pass, which removed this benifit, it has come as no surprise that Microsoft will not be bringing this feature to the launch of the Zune Pass in AUS. There is also questions being raised regarding if the Zune Marketplace which is coming to AUS will allow for individual purchases. Initial reports stated only the Zune Pass will be offered and no individual purchasing will be offered, but Zune Insider mentions that there may be a purchasing option available. Microsoft’s AU Twitter is currently requesting clarification from Zune Insiders regarding their initial post.